Sri Lanka Tourism Development Authority (SLTDA) yesterday entered into an agreement with Urban Development Authority (UDA) to streamline and fast-track the investment approval process to attract $3 billion investments by 2020. The key initiative was facilitated by the USAID’s Supporting Accelerated Investment in Sri Lanka (SAIL) project, which aims to provide policy and institutional support to improve the business enabling environment and promote foreign direct investment (FDI) in the country. Through this MOU, the two agencies will now agree to re-engineer the existing approval process, targeting investor convenience, enhanced efficiency, and effectiveness. The one-stop-unit or the National Unit for Investment in Tourism of the SLTDA will facilitate the entire approval process, which includes preliminary planning clearance (PPC), development permit (DP) and certificate of conformity (CoC). Addressing the gathering at the event, SLTDA Chairman Kavan Ratnayaka said that this initiative will cut down one-third of the time to obtain approvals for projects, which will encourage more investors, while also giving confidence to other main agencies to come on board with SLTDA to simplify the approval process for tourism-related investments. He also pointed out that SLTDA is now focusing on taking accommodation-related investments out of Colombo. “In Colombo, we are looking for experiences and retail. We are telling the investors to go with caution in their due diligence in Colombo with regards to accommodation. By 2020, we are expecting 5,000 star-rated rooms in Colombo, and we now need more activities and entertainment in Colombo now,” Ratnayaka added. SLTDA Director General Upali Rathnayake said after the approval process is fully streamlined according to the agreement, the average number of days required for the PPC will reduce from 59 days to 25 days, while the number of days required for PD process will lessen from 100 days to 30 days, and the number of days required for CoC will reduce from 85 days to 30 days. He said since 2010, when the National Unit for Investment came under the SLTDA purview, they have attracted about $3 billion worth of projects until the end of 2017. “Over the past eight years, we have attracted about $3 billion, and we are targeting another $3 billion worth of investments in the tourism industry within the next three years,” he stressed. According to him, during the last few years SLTDA’s National Unit for Investment has received 604 project applications, out of which only 326 has been approved, while 20 has been rejected due to land issues. “There is a sizeable number of projects that are waiting for various agencies’ approval. We are is discussion with these companies,” he added. He said that most of the projects are for hotel accommodation in different parts of the country, in different scales and categories.“About 95% applications are for accommodation widely above three to four star hotels, while rest of the applications are for restaurants and activities. These are mostly joint ventures, but there are sizable number of domestic and foreign investors,” Rathnayake emphasised. Towards the end of this year,he said SLTDA will be extending this to the Central Environment Authority, Coast Conservation and Coastal Resources Management Department, Department of Wildlife Conservation, and Department of Forest Conservation. In addition, they are planning to approach the Department of Irrigation, Department of Agrarian Services, National Building Research Organisation, Disaster Management Centre, Department of Archaeology, Department of Fisheries and Aquatic Resources, and Board of Investments, which will comprise the majority of approvals that are necessary to establish business in Sri Lanka. UDA Chairman Dr.Jagath Munasinghe said the institute now accepts only online applications for investments, and this agreement will further reinforce the activities they have commenced. “Our website is not just vibrant in its appearance, but it is progressing as a complete automated system. This has enabled investors to track on the progress of their projects,” he added. 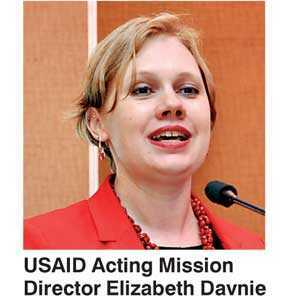 USAID Acting Mission Director Elizabeth Davnie-Easton said that since 2016,USAID has been assisting Government through the SAIL project, where this is one part of the larger effort by the whole US Government to support Sri Lanka in its economic and democratic efforts captured in the National Export Strategy (NES) and Vision 2025. “USAID has been working with SLTDA’s National Unit for Investment to help streamline the approval processes. The objective is to simplify the procedures, shorten time frames which in turn reduces costs, create more human resource efficiency and make Sri Lanka more attractive to foreign investors,” she added. She asserted that SAIL also supports smooth transition to these new processes, with training and technical assistance to all agencies involved, and will continue to support the shared objectives of these institutions. “We are happy to see the Sri Lankan Government’s commitment to make key reforms that have tangible impacts in the lives of its citizens, with these new investments, and creating jobs for the future generation,” Easton said.